Otitic hydrocephalus is a rare intracranial complication of middle ear infection. It has been described as a syndrome of raised intracranial pressure during or following middle ear infection with normal cerebrospinal fluid (CSF) findings, spontaneous recovery, and no abscess. , Taylor was the first to describe it in 1880, but it was only in 1897 when it became a recognized condition in literature after Quincke published a detailed report of it. ,, He had termed it as serous meningitis then. Several other terms like pseudotumor cerebri, toxic hydrocephalus, meningeal hypertension, benign raised intracranial tension, and otitic hydrocephalus have been used over the years. , The latter term was coined by Symonds in 1931. He reported three cases of increased intracranial pressure following chronic and acute otitis media with no clinical or serological evidence of meningeal inflammation. It remains the accepted term in the literature , in spite of being a misnomer because it can occur in the absence of otitis and dilated ventricles. We report a case of otitic hydrocephalus treated at our institute and present literature review of the same. A 24-year-old male patient presented with bilateral scanty, foul-smelling, purulent, blood-tinged ear discharge for 10 years, deep-seated headache for 10 days, and blurring of vision for 4 days. 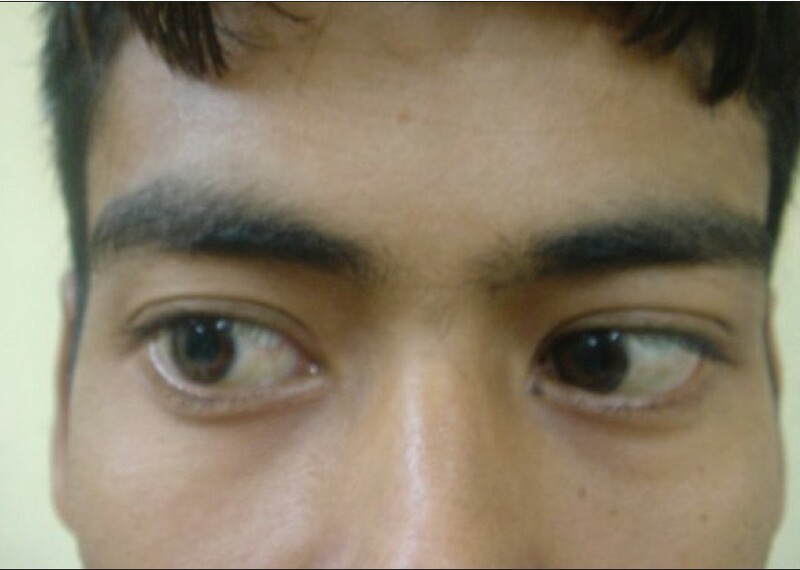 On examination, the patient had right lateral rectus palsy [Figure 1] and bilateral papilledema. There was aural polyp bilaterally. Following aural polypectomy, the pars tensa was seen to be grossly retracted bilaterally. In addition, in the right side, there was posterosuperior retraction pocket with discharge and destruction of the posterosuperior part of bony meatus adjacent to the posterior attic, while in the left side there was anterior attic destruction. Rinnie was negative bilaterally while weber was central. Lumbar puncture was done. Though the opening pressure was not measured, the microscopic findings were normal. Contrast enhanced computerized tomography (CECT) scan on head and temporal bone showed poorly aerated mastoid air cells with no focal lesions in the brain and normal ventricular system and cisterns [Figure 2]. The patient underwent right modified radical mastoidectomy with grafting. Cholesteatoma and granulation tissue was removed from the mesotympanum, attic, aditus, antrum, periantral cells, and sinodural angle. The sinus plate and dural plate were intact. 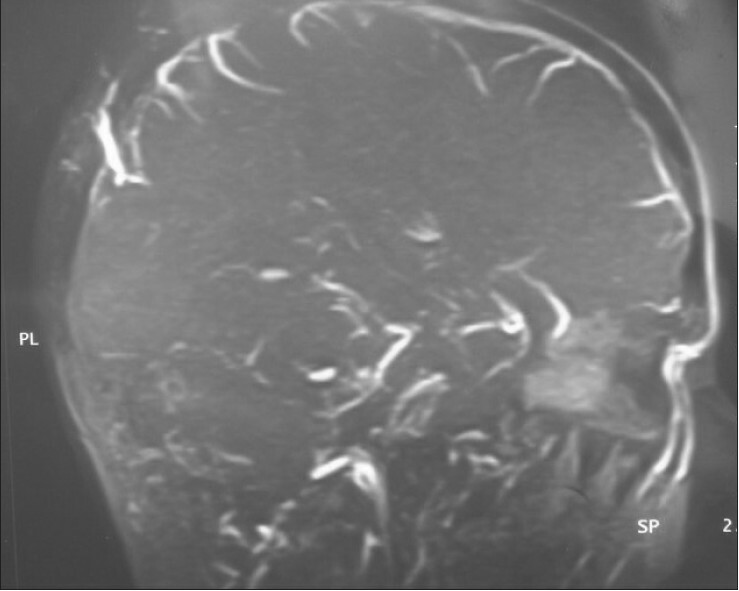 The patient's headache and blurring of vision persisted even after the surgery, so Magnetic resonance imaging (MRI) with magnetic resonance venography (MRV) was carried out [Figure 3]. It showed thrombosis extending from the lateral sinus to the superior sagittal sinus. The patient was treated with IV antibiotics, steroids, mannitol, acetazolamide, and anticoagulants. The patient was discharged after 44 days. He had no diplopia and his vision was normal at the time of discharge. The exact mechanism of otitic hydrocephalus is still not clear though association with lateral venous sinus thrombosis is often encountered. ,,, Symonds (1937) suggested that the features seen in otitic hydrocephalus would be explained by the presence of a nonobstructing mural thrombosis extending from the lateral sinus into the sagittal sinus. This impedes the CSF resorption by pacchionian bodies thus increasing the CSF pressure. ,, The superior sagittal sinus is often in continuity with the right lateral venous sinus, with the ratio being 6:4 or 7:3, so it is expected to occur frequently in right-sided ear disease. Our patient also could have developed otitic hydrocephalus due to his right ear disease. However, superior sagittal sinus thrombosis is associated with more neurological deficits than are found in otitic hydrocephalus, so their relation is still doubted. [1,9] Evidence of such a thrombus partially obstructing the sagittal sinus has been demonstrated, but it has not been proven whether it was a coincidental finding or the pathology behind otitic hydrocephalus. In our case, the clinical findings were suggestive of otitic hydrocephalus and not as expected in superior sagittal sinus thrombosis in spite of the thrombosis involving the superior sagittal sinus. Decreasing the intracranial pressure is important so as to prevent visual impairment due to papilledema. Medical treatments include usage of steroids, diuretics, and hyperosmolar dehydrating agents like mannitol. If medical treatment fails to normalize the intracranial pressure, continuous or serial lumbar drainage can be performed, , but with the risk of cerebellar coning. Other CSF drainage procedures like thecoperitoneal shunting may occasionally be needed. Optic nerve sheath fenestration is an effective means to decompress the nerve by reducing the CSF pressure on the nerve and thus improve vision. Our patient underwent right modified radical mastoidectomy under general anesthesia. He received high-dose intravenous antibiotics, steroids, mannitol, acetazolamide, and anticoagulants. Anticoagulants were used since the thrombus had reached the superior sagittal sinus. His condition gradually improved following this treatment with no neurological sequelae. Otitic hydrocephalus is a rare intracranial complication of middle ear infection. Because it presents with features of raised intracranial pressure, other conditions causing raised intracranial pressure have to be ruled out before diagnosing it. MRI and MRV are helpful in its diagnosis. Treatment is focused on eradicating the middle ear disease and lowering the intracranial pressure. 1. Ludman H. Complications of suppurative otitis media. In: Booth JB, editor. Scott-Brown's Otolaryngology. 6 th ed. Oxford: Butterworth-Heinemann; 1997. p. 3/12/1-27. 2. Levine SC, Souza CD. Intracranial complications of otitis media. In: Glasscock ME, Gulya AJ, editors. Glasscock-Shambaugh Surgery of the ear. 5 th ed. Hamilton, Ont: B.C. Decker; 2003. p. 443-61. 3. Sadoghi M, Dabirmoghaddam P. Otitic hydrocephalus: Case report and literature review. Am J Otolaryngol 2007;28:187-90. 4. Bandyopadhyay S. Pseudotumor cerebri. Arch Neurol 2001;58:1699-701. 5. Symonds CP. Otitic hydrocephalus. Brain 1931;54:55-71. 6. Grewal DS, Hathiram BT, Agarwal R, Dwivedi A, Walvekar R. Otitic hydrocephalus of tubercular origin: A rare cause. J Laryngol Otol 2000;114:874-7. 7. Go C, Bernstein JM, de Jong AL, Sulek M, Friedman EM. Intracranial complications of acute mastoiditis. Int J Pediatr Otorhinolaryngol 2000;52:143-8. 8. Smith JA, Danner CJ. Complications of chronic otitis media and cholesteatoma. Otolaryngol Clin North Am 2006;39:1237-55. 9. Tomkinson A, Mills RG, Cantrell PJ. The pathophysiology of otitic hydrocephalus. J Laryngol Otol 1997;111:757-9. 10. 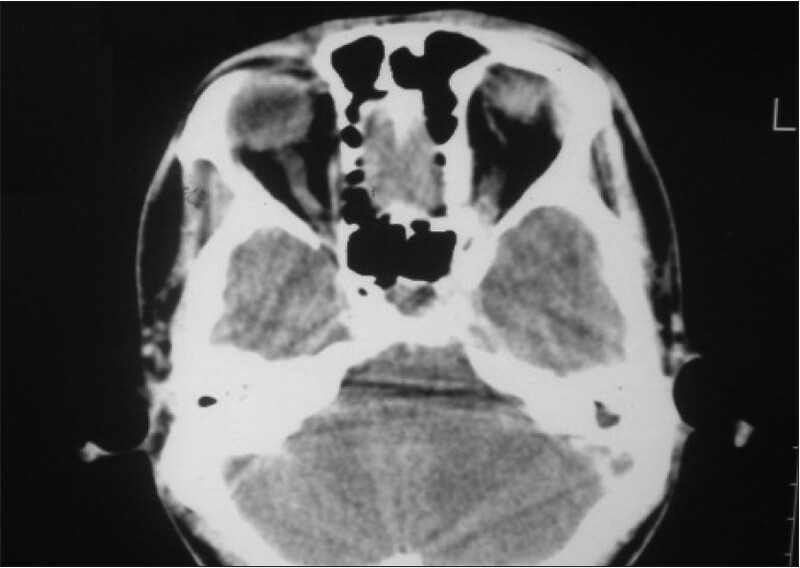 Kuczkowski J, Dubaniewicz-Wybieralska M, PrzewoŸny T, Narozny W, Mikaszewski B. Otitic hydrocephalus associated with lateral sinus thrombosis and acute mastoiditis in children. Int J Pediatr Otorhinolaryngol 2006;70:1817-23. 11. Omer Unal F, Sennaroglu L, Saatci I. Otitic hydrocephalus: Role of radiology for diagnosis. Int J Pediatr Otorhinolaryngol 2005;69:897-901. 12. Viswanatha B. Otitic hydrocephalus: A report of 2 cases. Ear Nose Throat J 2010;89:E34-7.